The first time I remember being unhappy with my body was at Primary School - I desperately wanted to be like the other girls in my glass and shave my legs. It didn't really matter to me that I had blonde hairs on my legs that were hardly visible... all I remember thinking was, if only mum would let me shave my legs I will be happy for the rest of my life and never worry about my body ever again! Well, some time later I was allowed to shave my legs... it even became a big family event! I remember mum buying me some special razors and her and my brother hanging out in the bathroom while mum showed me how it was done. But for some strange reason that novelty wore off and along came the many other things I longed for to be able to 'fit in' or rather 'stand out'. I did my own ear piercings and tried to do my own dreads (that was a total flop!) and went through stages of disliking being tall, wanting my blue eyes to be brown, my blonde hair to be red etc. I hated dressing 'normally' so started wearing all sorts of strange things. But then one day it hit me (or rather God broke through)... I thought I didn't like myself... but really for me it came down to pride... I was totally obsessed with myself and how others perceived me. All of a sudden I felt totally free to be me and to actually like the way God had made me. Now don't get me wrong... I'm not one of those 'make up is evil' people or promoting keeping your hair totally natural... I couldn't live without my hair straightener! I think God is such a creative God and He loves it when we have our own style, but I also know He wants us to put others before ourselves (which often means getting over ourselves) and also to learn to love ourselves warts and all! All of a sudden I found that I wasn't obsessed with my reflection in the mirror, or in comparing myself with others. I realised that I couldn't change my eye colour or skin tone... and I was meant to be me. I wasn't even phased when a relative... the one who everyone said I took after with my nose... went and got a nose job. I found it rather funny! So I encourage you all to get your focus off the things you don't like about yourself, and start to practice thankfulness. I know sometimes it can be easier said than done... but the more you practise, the easier it gets. Really good post Kristy! A good challenge! I remember shaving my legs for the first time.... desperate to because my friends did.... but I didn't have any hair on my legs! I was in 3rd form. And then it started growing fast! Arghh. oh my mum wouldn't let me shave my legs for ages either! Now I hate shaving them! Such a true post. 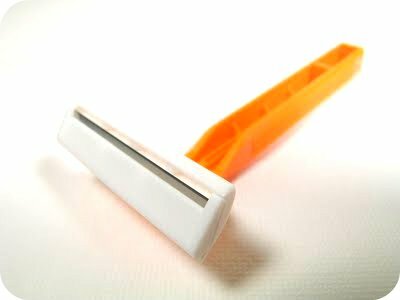 First time I shaved my legs I did it dry (with the exact same razor as the one pictured) and I did it side ways and gashed my leg!! Think I was about 12 so obviously I was completly clueless! I dream about milk biscuits. I shave them everyday! I hate the stubble feel! I have begun to accept the things about myself that can't (well they could be if I had lots of $$$) changed and just be happy the way I am. I do need to lose a few pounds to feel better, be healthier and fit into most of my clothes more comfortably. But, that is doable! Well said, insightful. I love it when people can be real online. I think when we stop focusing on ourselves, life gets so much better. have you read A million miles in a thousand years by Donald Miller? You two have a similar writing style. I love that book.